The following was excerpted from Carly Wood’s speech at the Distinguished Women’s Award Celebration. Hello, my name is Carly Wood and I have been a Girl Scout since the age of 5. As a 2015 Distinguished Shadow Girl I had the honor and the privilege to shadow Ms. Georgette Kiser, a 2015 Distinguished Woman Honoree and Managing Director and Chief Information Officer at The Carlyle Group, a Global Alternative Asset Management Firm. My shadow day began by meeting with Ms. Kiser before she led her first Information Technology or IT town hall meeting. I immediately felt welcomed during our morning discussion and Ms. Kiser explained her position and role in the company and encouraged me to ask a lot of questions throughout our day together. She also advised me to not just be the user of technology, but to be a creator and to always be thinking of ways to improve it. During the town hall meeting I was able to get an overview of the IT organization and the goals for each department which included improving technology and making it more efficient. I was also able to learn about Ms. Kiser’s philosophy as the CIO of The Carlyle Group. Ms. Kiser promoted communication within her team and told everyone that her door was literally always open. She also promoted innovation, creation, problem solving, and constant brainstorming because when something breaks, you then have the opportunity to improve it. 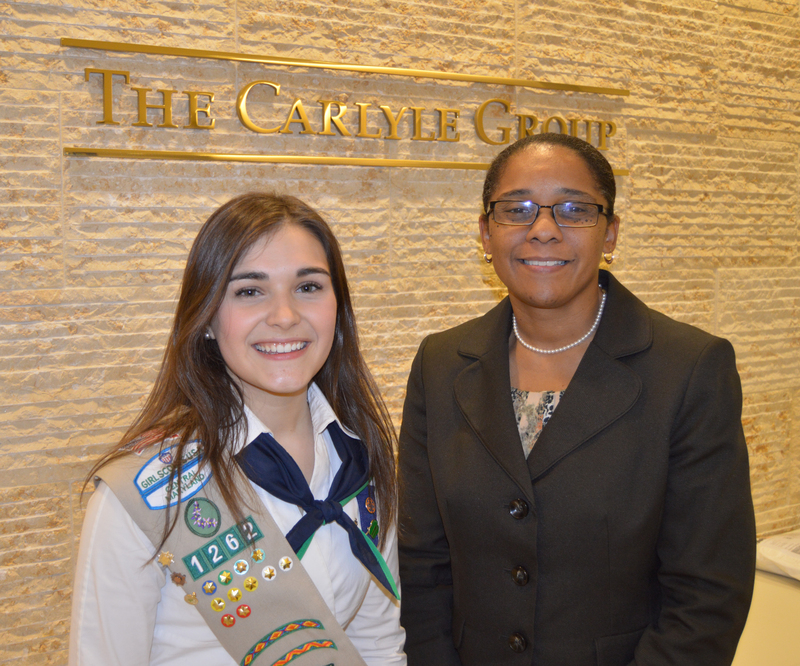 During the meeting, Ms. Kiser’s passion for her job and The Carlyle Group was undeniable. She is also very dedicated to causes that promote and empower young women, such as Girl Scouts! During the day I had the privilege to meet with many IT principles at The Carlyle Group. One of the major themes of discussion throughout my shadow day was the process and path in which Ms. Kiser and the principles at Carlyle took to get to their current positions. Many of them did not have a straight path, meaning they started in a career completely different than where they are now. Towards the end of the day, during a discussion with Ms. Edie Ashton, the Principle of Data Integration Services, she told me to always say yes to opportunities that will make my life or career better even if it involves risk or change. While reflecting upon my day I realized Ms. Kiser and many of the other principles I talked with had to “say yes” in order to get where they are today! Before Ms. Kiser took her job as the Managing Director and CIO at The Carlyle Group she shared with me that she was happy and comfortable at her position at T. Rowe Price but because she said “yes” to a recruiter from The Carlyle Group she now has a wonderful and prestigious position. During my shadow day with Ms. Kiser I learned a lot about information technology and was able to see first hand what a day in the professional life of a successful woman executive is like. It confirmed my goal to pursue a degree in mathematics but now I am open to exploring economics as well. Throughout my life and career I will not limit myself, and I will say “yes” to exciting and challenging opportunities that come my way. I am determined to find a career that I am passionate about and take Ms. Kiser’s advice to “be happy and don’t just collect a paycheck”. Ms. Kiser provided me with information, guidance, and memories which will help me to make important high school, college, and career decisions that I will soon face. I am so grateful to have shadowed Ms. Kiser, someone I respect and admire, and I look forward to her guidance in my future. Excellent review, Carly Wood, I am glad that you had this opportuniy and benefited from it.